Notes: Wow. Okay, this sentence means nothing close to what the lyrics are supposed to mean. It actually translates to “I’m going to convince you”. There was nothing I could do to convey the meaning and preserve the meter, so I took the general sense of this line and the next and I’ve kind of changed it and redistributed it. The phrase kala…poiu derives, of course, from kala, which we’ve seen before. We’ve also seen a phrasal verb like this one before. Therefore shall I celebrate. Here’s one of my favorite Rick Rolls! My wife and I are big fans of Foster’s Home for Imaginary Friends. Apparently, one year during the Macy’s Thanksgiving Day Parade, they Rick Rolled the parade itself. You can see the video here, and read about it here. Today’s iku is a pretty straightforward ikunoala, though it might not appear to be so on the surface. It’s a combination of fe and ei. Rather coincidentally, it looks as if there’s a line over the “Z” shape to indicate where the semantic domain of this word is located. Fei is one of a number of prepositions and adverbs that can combine with other verbs to form new phrasal verbs. For example, the verbal phrase mata…fei, when combined with an object (or when there is an object that is understood to exist), means “to visit”. Here it just means “look up”, and I think, in context, that’s quite clear. In other news, I really need to get back to a sane schedule… I can’t be going to sleep this late anymore. Notes: Funny story about this iku… I think I originally intended this word to be oko, in which case it would have been a perfect ikunoala. I think, though, I either forgot that that was the word, or I mixed up the glyphs for ko and ku (which, at this point, seems quite absurd to me, since the Iku for ku is so distinctive). As it stands, though, the iku looks like a face with a superimposed o over it, which is pretty good. It looks like a face in the middle of saying “no” (oku). I’ll take it! For the content, I changed the lyric to, “You won’t hear this from another guy”. Hey, actually, you know what? I could switch out ika for toi (“any”) and get the rhyme. For some reason I don’t think it sounds as good, though… I reserve the right to put it in there, though, if I change my mind. Here’s something I found randomly on the internet that’s pretty good. Mouse over for the answer! Notes: OMG. I just created the best word ever. But I refuse to give it short shrift. The word it’s coined from hasn’t been done yet, so I’m going to wait to do that word, and then I’ll do this one. But, oh, man, it is goooood! For today’s great moment in Rick Rolling, how about a strip from one of my favorite comics XKCD (complete with hover-over message)! Notes: Continuing with my translation of Rick Rick Astley’s “Never Gonna Give You Up”, we have a word derived from another word I just recently posted (fancy that! It usually works the other way around…). In case you’re curious about how a partial reduplication of “number” can get us to “rules”, it comes from the sense of fatu that means “orderly” and “obedient”. The favatu are what you’re supposed to do or follow. If you do, you’re fatu. One thing that a number of conlangers (myself included) are having trouble with when it comes to translating this song is keeping with the meter. The problem has nothing to do with the conlangers, but could have something to do with our native language(s). English (and German as well) have a lot of content words that are monosyllabic. One thing I’ve noticed is that many of us conlangers who have a Germanic language as our first language tend to create languages that are just the opposite. Take Latin, for example. You can count the number of monosyllabic content words on two hands and a foot—and even those aren’t always monosyllabic (rex, “king”, is monosyllabic, but put that word anywhere in a sentence other than subject position, and there it goes!). It’s this type of language, it seems to me, that Germanic-speaking conlangers go for; there aren’t many like English or Chinese. So think about the first part of the line above: “You know the rules.” Without even knowing the exact words, I can look at that clause and tell you that it will be six syllables at the minimum in Kamakawi. Why? Because there are three content words: “you”, “know” and “rules”. There are fewer than 40 content words that are monosyllabic in Kamakawi, and I pretty much have them memorized, which means that each of these words will be at least two syllables long, giving us at least six syllables—and probably more. That’s two more syllables than the English line already, and we haven’t even gotten to the “and so do I” part. Rather than try to translate it piece by piece, then, I changed the line to get as close to the meter as possible. I changed it, essentially, to “The rules are known by you and me.” Passivizing eats up a syllable, true, and “rules” turns out to be three syllables. But getting rid of a verb in the second half of the clause really frees things up. For an eight syllable line, then, I cut it down to twelve in Kamakawi, which itself can be cut down to ten in singing by cramming a couple things together (ti ia can become tia), and those extra two syllables can be throw in during a second or two when there’s no singing. 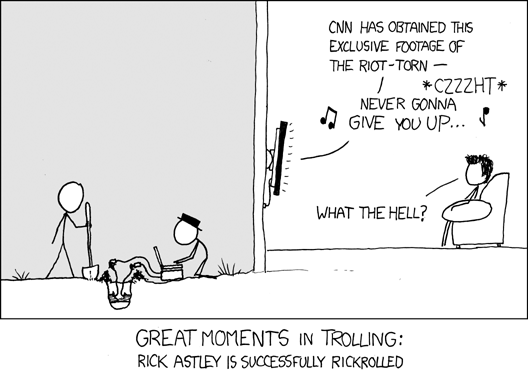 While I’m translating the song, I’m going to link to some of my favorite Rick Roll stuff online. Today, I’ll link to my favorite Rick Roll video: The Muppets’ Rick Roll Video. Enjoy! Notes: Oh snap! You all have just been Rick Rolled! This isn’t coming out of nowhere, though. A few days ago, on the Rejistanian Word of the Day Blog, friend of the KWOTD Rejistania posted an entire translation of the (in)famous Rick Astley song. She then challenged me to translate it into Kamakawi, and I’ve picked up the gauntlet! The problem with this translation (i.e. if one were to use the translation and sing the song live) is meter. It’s not difficult to rhyme in Kamakawi (only five vowels, eight consonants), but words can accrue a number of syllable that can’t be easily jettisoned. Take this first line. “We’re no strangers to love” is six syllables. The Kamakawi translation above is eleven syllables. Yikes! One can get away with running ie eli together in song, but that’s still ten. Removing the pronoun eya would render eight, but then there’s no clear way to get the “we” in there… Plus, with no previous referent, the sentence would sound really, really odd. One might imagine that oku could get shortened to o, but that only buys us one syllable (nine). Hmmm… But on testing, one can add ie eli (elided) as an afterthought after eya. It would occur after the word “love” in the English and before the start of the next line. I think one would have to do that (and will have to do that for the rest of the song) to make this work (either that or translate stanzas as a whole and cut them up in a different manner from the way the song does, contentwise). We’ll see how I manage! Oddly enough, the most interesting word in this line is keili, but since I haven’t done “love” yet, I felt I should (it’s a good word to know). I’ll get to keili later. The iku for eli is a straight-up ikunoala with a little V for e placed on top of the glyph for li. I think it’s a fortuitous combination, as the resultant glyph looks nice. I also like how it incorporates the “giving” hand. Well, actually, it’s kind of a “giving” and a “taking” hand, but that’s what love is, after all. Noala ei tie kepo iviki. Anyway, in Kamakawi, I figured since it’s a matter of an extra letter (not even an extra syllable), ti would make more sense here than the direct object marker i. It’s an instrumental, true, but it also marks sources frequently, and that’s what I think of when I read this: The cause of the poem is the body—the source of its inspiration. Ti, then would seem most appropriate. Okay, before I comment, a couple of explanations first. In order for the count to work, Jim redid the intervocalic sound changes (so all instances of V became F and all instances of ‘ became H). He kept, however, both Y and W as phonemes. I think this is probably something one ought to do, since there are minimal pairs, but even those minimal pairs aren’t straightforward (the ones that don’t have the glide are often morphologically complex). In the overall syllable count statistics he came up with, then, I counted all occurrences of Y and W as I and U respectively. That, I think, gives a more accurate count. Okay, now for the results! First, no one should be surprised that the first five spots are taken by the five vowels. Kamakawi is a language that allows one onset consonant maximum, and no codas. This means that every syllable in Kamakawi will have at least one vowel but at most one consonant. Since there are tons of syllables that have no consonants at all, it’s no shock that the vowels dominate the count. I’m also not surprised to see A on top of the list. Even with the prevalence of words beginning with the i- prefix, if one looks at all environments, I think there’s no question that A would win out. What I found next most surprising is how little there is of T and N those are two of the most common consonants in English—and with good reason (the alveolar ridge is the richest place of articulation in the human mouth, and its consonants are favored the world over—especially in inflectional morphology). Oh well. Perhaps it’s the Hawaiian influence creeping in (for T, of course, not for N). I’m not surprised to see F/V at the bottom. It’s certainly the least common sound in Kamakawi. But I am surprised that H/’ wasn’t higher, and that P is so low. If I were to put it ahead of anything, I would’ve put it ahead of M, but take a look at M, up there as the third most common consonant! That I never would have guessed. So, there you have it! The phoneme frequencies of Kamakawi. Again, this is based on an older form of the lexicon, so it’s not 100% up-to-date, but I expect that, for the most part, this pattern will hold. Notes: Awhile back, a commenter posted a short comment about how conlangs ought not have the same number of words beginning with each letter/phoneme in their inventory. This was when I had pointed out that there weren’t enough l words in the Word of the Day. I pointed out then that, as I select which words to do, the Word of the Day words were not a random sampling of Kamakawi words, but that got to me thinking: Just how close are the counts? That’s the Word of the Day breakdown. Now let’s compare that to the actual breakdown in Kamakawi. To do that, I’m going to make use of a statistical analysis conducted by a great conlanger Jim Henry a year or so ago (two years? Can’t remember). Jim created a Perl script which he ran on my modified Kamakawi dictionary (he stripped out all the definitions leaving just the words). What it did was it separated the entire list into syllables, and counted initial, final, medial and total syllables. Though the lexicon has since expanded, I think it’s a fair representation of just how frequently a given syllable is used in Kamakawi—and in which position. Quick note on the above: F and P have pretty much the same percentage, but there are two more F words than P words, so I didn’t list them as tied. Oddly enough, though, there are exactly the same number of words starting with E, O and U (or, rather, there were at the time that Jim ran these statistics. I’m sure that’s no longer the case). As you can see, the percentages are close sometimes, but not near enough to be accurate. Also, you can see by the real count that I words blow all the rest out of the water. That’s due in large part to the i- prefix which enjoys a lot of use. If you stripped those out, K would be the winner, which isn’t surprising (or, at least, not to me, the one who coins the words). Other than I, though, I realized that it shouldn’t be surprising that the vowel-initial words should come in last. Vowel-initial words can be thought of as, essentially, beginning with an empty consonant. If you added them all together, then, you’d get a count much like the other consonants, where, with K, for example, you get every word that starts with ka, ke, ki, ko and ku all together. A small note about the iku here. This is essentially the Kamakawi equivalent of the pound (#) sign. It just means “number”. You may recognize this iku from the entry for ape, “one”. All the number glyphs are shapes traced from the original number system, which was just a series of dots. Since one dot is too small for a character, a short stroke (or dot above, originally) was added to the glyph for fatu, and that’s what became the iku for “one”. Basically, it reads as if it were “number one”. All right, now to start on something exciting for the next week or so! So my wife’s brother sent us a book for us to scan and send to him while he’s in Sénégal (apparently he needs to finish it for school). I opened it up and put it on the bed, and Keli was fascinated by it. She rubbed up against, she started to bite it, she clawed at it a bit. Eventually she laid down on top of it, finding it to be a fine seat. We did get it scanned in, but not until she’d had her way with it. This word is derived from kava—or at least that’s what it looks like. It’s not immediately apparent to me what fire has to with writing, but the derivation from “write” to “book” is pretty clear. Oh, but I forgot to do an entry for “write”… Oops. I’ll get to it by and by. Notes: Absolutely no inspiration for this word or this sentence. And you know what, let’s extend that to this iku. Man, oh, man… It’s just the tooth from ke slapped inside the glyph for na. I experimented, initially, with putting the tooth up in the upper left-hand corner, but it just didn’t work. So this is what I ended up sticking with. And hey, speaking of things I have never wanted to do: Diving off a cliff into the ocean is crazy. There’s just no reason to do that—ever—not even to save your life! No, sir, no reason. You are currently browsing the Kamakawi Word of the Day blog archives for July, 2010.